for i have not discovered a 'fountain of youth' hidden under a mound of moss in my back yard, nor have i unearthed a pot of gold beneath Gladys, to pay for electrolysis and other such things. but before you start "booing" and shouting "well, that's a load of old crappity crap Tif", let me enlighten you to the ways of 'ignoring' and how it can change your perspective on life. and i have a crafting business i am so eager to take to another level and yet i do not know quite how. so that's where my 'challenge' comes into the picture. for instead of seeing my 41st birthday as a bit of a 'bleep' on the horizon, i chose to use it as a marker for the start of my challenge, thus causing me to look forward to the date, even relish getting to 41 and starting on a whole year of 'challenge'... a perfect way to 'ignore' i am even 41, i will be way 'too busy' being 'busy with my challanging ways' everyday to give it a second thought. how perfect is that!!! those pesky nostril hairs can't get to me, those frown lines aren't having a last laugh anymore, oh no... for i am studying the fine 'art of ignoring' with a distraction technique called 'a challenge of the utmost kind". now of course you are probably all thinking, well that's not such a big deal. but i beg you to take a few minutes of your day to ponder what really is involved when choosing to buy only handcrafted and secondhand for a whole year for one's self and one's home... not the 'icing' on the cake sort of things but the heart of the nitty gritty stuff that goes into one's home and one's closet. 'the basics' if you will..
i was giddy with excitement when i decided to participate with my little brain's thoughts, as i get closer to the 'kick off' i'm not quite so giddy as 'Mr Doubt' has come knocking, trying to weaken me with thoughts of the problems that may occur along the way. however, just to be clear, i do have two exceptions to my challenge. if such a time occurs that i require new undies, most doubtful as i do not care to be bothered with buying undies, then i shall be purchasing new (no need to go into the 'whys' of that one), the same goes for tights. being a skirt and dress girl, it is most important for winter that i have woolly tights to keep my 'skinny pins' warm. i have never seen these secondhand at the thrift store so i am allowing myself to purchase a new pair if an old pair is beyond darning... and trust me, most of my tights do have darned holes in them already. for one year becoming a handcrafted, thrifty mama... who will try very hard to get creative with her wardrobe and her home, which according to our #2 when i announced my 'challenge' isn't that impressive. "well that's not a challenge, look around you mother, we practically live in a thrift store"
and she has a point, i feel. Good for you! It is great to read that you have set yourself this challenge and it will be really interesting for us to read how you get on with it. Of course the undies, tights & gifts have to be outside of this remit!!! Of course!!! I can't imagine anyone coveting someone else's cast off undies or tights!! only to spare the giver's feelings, of course! I'm not even supposed to be on here right now. (I'm having a yard sale/Whimsical Junk sale in two days.) But I had to come see what your challenge was! I love it! I've been 'trying' to do the same for some time now, but have slipped up when the kids have needed new clothes at the changing of the seasons (even though we thrift most of them). Secondhand jeans, without holes in them, for young children are difficult to find sometimes! I think it's a great challenge. It really makes you stop to think about your purchases. And, when you're already an avid thrifter, it's a natural transition. Have fun and make the most of it. It's a very rewarding thing to do! P.S. Love the new things in your shop! Hello, I've just found your blog and it is lovely! Your positive outlook on life is so nice and refreshing. I wish you the best of luck reaching your new goal. I love lurking around your bloggity blog...it's so comforting. Like a good cup of tea. I too witter on about M.A (mid age) and I bore myself with it so i am inclined to agree with you about the ignoring thing. But my reason for tapping away here is to say I do believe we share the same birthday and it is always nice to find a birthday twin. Mine is the 20th Sept and I'm guessing yours is too~hence the declaration? i have noticed that all the nicest blogs are by people with birthdays in September. No bias intended but it's probably all that Virgo perfection and attention to detail. You go girl! Looking forward to all your beautiful creations! Ever so uplifting. And an inspiring way to recycle. Do love your new things. And, middle age doesn't start until 50, right? good luck to you! i could never pull it off. i have been known to occassionally shop at anthropologie and related shops. not sure i could give it up. plus a son who is overly into transformers. But it's been really fun to concentrate on giving to others, and giving thoughtfully. I wouldn't change a thing about how we've purchased (or not purchased!) things this year! Good for you Tif, I know you love your thrifty finds but this could be a toughie!Can't wait to see how you get on! Love your daughters response too! What a perfect idea! I am sure you will be rewarded with lots and lots of positive energy! what a fabby idea miss Tif! i know you're going to have a lot of fun with this... and i know you're going to manage it beautifully, even if 'Mrs W. Machine' does take a hissy fit and test your thrifting skillls to the limit! That is a most excellent challenge. I'm sitting here pondering whether if at only 38 I can pull it off or if I need to wait another almost three years or only until I find a ghastly but nonetheless impressive nostril hair. Oh my goodness, what a neat challenge miss dottie angel. Please, keep us informed on how it goes. I am so proud of you! Stay encouraged...your bloggy friends are behind you 800 percent! i can just hear this in a lovely british accent... i love this. so so much. Tif, I am turning 41 this year as well, and feel inspired to challenge myself too. My wardrobe and drawers are overflowing with clothes, yet I always feel I nhave notheing to wear. I am going to start with not buying anymore things til christmas. Good luck...I think challenges like that are a relief in a way sometimes-no pressure to buy things you don't reeaally need. 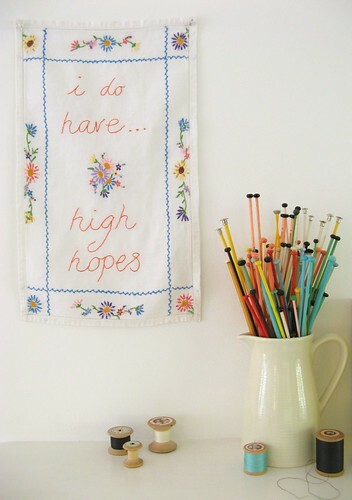 i do have high hopes that you can do it with gusto! a very noble challenge!!! good luck! I'm so excited about your challenge! I tried it once for two months, and it was quite fun. A lot of Anthro items have that hand made detail that makes them so wonderful. Love this idea! Oh I love, love, love this idea. I am thinking long and hard about taking the challenge, but am not sure about what my man might think about it. Oh...I left a comment a couple of days back and it's not showing...perhaps I was rejected! It was a nice comment, honest! This is a great challenge...good luck. And your forties is a great decade. Go girl! i really really do appreciate your "you can do it" attitude! Does your challenge extend to stuff you buy your kids, I am wondering about school uniform, shoes and swimsuits? Hello! came across to your blog from Emma Lambs. I think you will excel at this challenge from all the comments so far that I've read. I just found your blog through Artsy Mama's. It is Wonderful!! 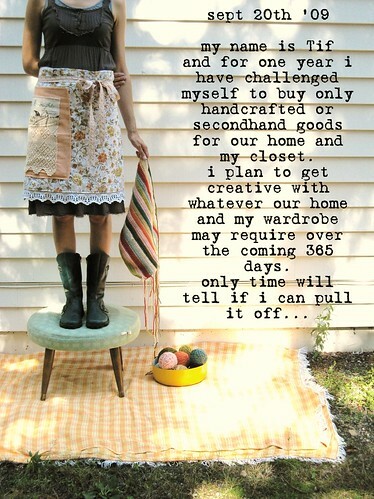 Love the idea of the challenge my mom and sisters and I are thrifters/crafters. Last year we did a thrifty/crafty Christmas and it was sooooo much fun (We bought normal store bought gifts for the guys but included the kids) We set a limit and each of us exchanged thrifty goodness boxes, with loads of oohs and aahs!! The kids really got into it and had to really think about what they were going to buy their cousins. It was a great lesson in it is the thought that counts!!! Are you planning to do this with Christmas gifts also? Just wanted to know it can be a great fun challenge!!! We had so much fun last year we are doing it again this year!! (That is not to say that the kids did not get any new toys/things also they did.I think they enjoyed everything equally though.) Have Fun!! misty, thanks for stopping by... my mind has already been drifting towards christmas. my family often to get handcrafted gifts but not so much the kids.